I have a question, someone can help me? Someone have the same problem? And solve it? How? I have installed Allegro with Homebrew, but i need to replace the directions in the Search Path? or add a new? Please tell us what errors you are getting, and at what step they are occurring. Use Google Translate if you need to. You need to link with allegro_main. The linking order may be important too. Don't think so in this case. I've attached a 'simple' project I just made up to check the necessary steps. See if this works for you. But where i need to put the .dylib files? Yes, the project goes well, but have an breakpoint, i don't know. I put also an image of your simple project. You can see the names are in red. That means they can't be found. If you have installed Allegro from homebrew they should be in /usr/local/lib. Also when it says 'library search paths' in XCode it means path to a directory, not a file. That's why you get the 'ld warning directory not found for option -L' message. Looks like it may not be installed properly. I don't have any of those -static files. I am not sure where they have come from or what version. This is the thing that i see. Maybe i need to uninstall everything and reinstall it again. Do you know how uninstall allegro and it's libraries? or do you know a tutorial in which tells how? i did it, but i got the same errors. Can i do you an other question? 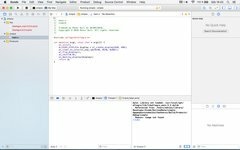 What specifically i need to do in Xcode? You are visitor #58,671,855 since January 1999. Page generated in 0.023765 seconds.